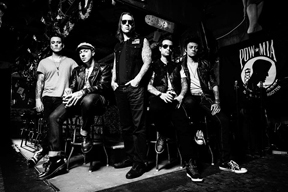 The last three years have been nothing short of a roller coaster ride for Avenged Sevenfold. In simultaneously achieving their greatest success while experiencing their greatest loss, they've held on to their sense of family to see it through. You can't help but to pull for them. Even so, and despite adding the talented Arin IIejay to their roster, the band has remained haunted right into recording their newest album, Hail To The King. As a much more blues-infused classic metal sound, expect to hear fewer experimental tricks as the band mostly turned out to write good music. And yet, in doing so, Hail To The King cuts both ways as a deep departure from their previous albums. In short, for every highlight, hidden gem, and great moment found on Hail To The King, there is always an ever-present and overwhelming sense of tiredness and mourning that has latched itself onto the music. 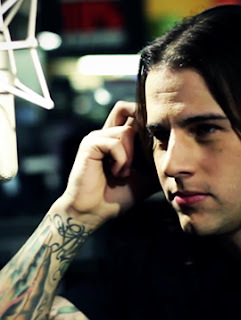 Aside from simpler song structures and slower tempos, it's especially obvious in M. Shadows's vocals. Hail To The King is a richly crafted departure, enjoyable but suffered. Don't misunderstand me. Shadows can deliver the goods for an overall groovier metal sound, but it sometimes feels like he is holding everything back. Meanwhile, the abundant solos from Synyster Gates always feel like he wants to barrel ahead, leaving Zacky Vengeance and Johnny Christ somewhere in between. The lead title track is one example. The best parts of the track are inside the song, well after the methodic introduction and verse. The best of it picks up after the catchy chorus and includes a guitar solo that becomes the heroic moment in the song. Without the solo, it might even be forgettable. Several of the songs feel that way on Hail To The King. Despite landing a number one position on the United Kingdom album chart, where a throwback metal movement has been maturing for years, there just isn't the same experimental bite that emerged on the last album. Still, there are some songs worth talking about. Namely, This Means War captures equal parts menace and regret as Shadows attempts to reconcile the wrongness of war and weakness of cowardice. The regret of it leaves nothing more than a husk of a man after his service, with his true spirit neither known nor missed by anybody. Following This Means Wars is the darkest track and one of the most enjoyable on the album. Requiem opens with Latin chants: Prodigia comploratus. Silens oro. Regnet exitium. After the chants, Shadows loosely covers its meaning in the next verse. But more exactly, it coveys mourning and praying as something great has been destroyed. And despite the ominous tone, the lyrics hint at being given the strength to rise again after loss. That alone sets up the another standout. Crimson Day resurrects the band's ability to bring sadness into a metal confessional, with Shadows sharing how someone impacted his life albeit, perhaps, too late. Other tracks like Coming Home, Planets, and Shepherd Fire all have some impact, but perhaps none come close to the bonus track St. James. St. James, which is an homage to Jimmy "The Rev" Sullivan, sounds much more aligned with the last album than this one. It's my personal favorite. Some might even find it ironic that the most upbeat track on the album is the homage whereas so much of the album is slow and sorrowful throughout, making you wonder if many of the songs could have easily been written to erase the mourning that the members have felt for the better part of four years. Hail To The King Rises To 6.2 On The Liquid Hp Richter Scale. The review might be tempered as a standalone album, but anyone who loves Avenged Sevenfold won't necessarily be disappointed. The odd thing about the album is that there is nothing wrong with it. It just doesn't resonate with the same strength as their previous work. It's easy to get that it is not supposed to but that doesn't dull the feeling that you want something more (perhaps a few older tracks) tossed in to feel fulfilled. You can find Hail to the King on Amazon. You can also download the album from iTunes or purchase a disc from Barnes & Noble. Regardless how you feel about the album, there is no doubt that Avenged Sevenfold is still on top of their live performances. The tour starts now.